Chef Matt Steigerwald is on Great Taste this Week! Ever wondered about the steps required to open a top-notch dining establishment? Chef Matt Steigerwald has gone through the process multiple times, including his current initiative with Wilson's Orchard. Join Matt and me on this week's broadcast, and learn about the creation of Rapid Creek Cidery. I am certain you will find it inspriring and insightfull to listen as he describes the process of building a concept, menu, suppliers, and staff. I'm super excited as I'm back in the KRUU studio for the first time in many weeks. At the outset of the show, I welcome back certified health coach, and beauty editor, Jolene Hart. Jolene is someone who really understands that eating is critical to inner and outer happiness. Her new book, Eat Pretty, is replete with guidance that will uplift you 365 days of the year, and support your quest for a more positive lifestyle. Jolene does not subscribe to one particular style of dietary recommendations or way of living. Rather, she has distilled from her personal experience, research, and client relationships concentrated nuggets of information designed to enhance anyone's well-being. Though the book's admirers tend to be female, I believe its tips work for any gender. Tune in, and let Jolene inspire you. Last week's visit with Tenaya Darlington author along with her brother, André of Movie Night Menus, inspired me to replay the following show about movies and food. If you want to curl up on the couch with a great food flick read on. It was so much fun discussing food in films with Caroline M. Grant. Caroline and her collaborator, Lisa Catherine Harper, are the editors of The Cassoulet Saved Our Marriage, a fascinating book of diverse essays focussed on "true tales of food, family, and how we learn to eat." Caroline is an avid movie lover so we spent the hour talking about some of our favorite films where food plays a role like Aing Lee's Eat Drink Man Woman and its Westernized counterpart, Tortilla Soup. Dinner Rush, The Big Night, Moonstruck, and others were part of the banter before time ran out. We had many other films on our list, but I'm curious how the ones we ended up talking about fit in with your favorites. Let me know. Send your comments to greattaste@kruufm.com. Caroline's kids also nominated their favorite food film. Food and Classic Movies and Supporting Local Eats! This week's show starts with a discussion featuring two of my favorite topics-menus and movies. Tenaya Darlington and her brother Andre have paired classic movies with great eats in a book that is fun on many levels. Whether you need a quiet night to kick back with a friend or two or want to throw a party, Movie Night Menus is chock full of terrific food options that fit perfectly with some of the best flicks ever made. The book is "...organized chronilogically, so you can eat and drink your way through American cinema," writes Tenaya. I think she and I are going to get along just fine so tune in for our conversation. Check out their new website HERE for recipes, tips on entertaining, and I'll bet plenty of great cheese recommendations. Two months ago on a stunningly beautiful October day, my wife and I met Alan Tardi at Agriturismo Il Torriglione in La Morra, a small Piemontese village in the Langhe. Il Torriglione sits atop one of the many rolling hills dotted with grapevines, where the dominant grape is Nebbiolo in the Barolo wine-producing zone. The Gagliasso family makes the only wines served at the agriturismo and winemaker Luca Gagliasso's mother and sister can be found in the kitchen or greeting hungry patrons on the weekend. Over a bottle of their Barolo, and through many courses of typical Piemontese cuisine four hours slipped away unnoticed as we talked of family, wine, and champagne. Our thanks to Alan for a fantastic afternoon that we will always treasure. Great Taste listeners may remember hearing Alan discuss his James Beard award-winning book Romancing the Vine, previously on the show. 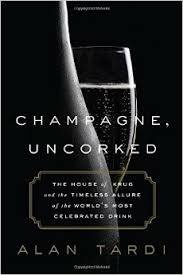 This interview was aired last year after the release of his latest tome about champagne. The story of Champagne is a complex one with hundreds of years of history. It is one of the most famous wines made in France. A wine cannot be named Champagne unless the grapes are grown in one of the 320 appellations that comprise the entire Champagne area. Fact: Every champagne is not extraordinary. I bet you have experienced some like that. Many, though, can elicit a transcendent experience. A few years ago, Alan was allowed access to one of the most famous and secretive champagne houses. Zagat ratings rely on three criteria for judging restaurants-food, decor, and service. Each of those categories are critically important, and, in general, work as a reliable guideline for diners who want to take the pulse of a specific dining spot. Depending on my mood, how much time I have, and whether I have a friend in the area who has already run restaurant interference for me, I’ll check Zagat, Chef’s Feed, Yelp (be very careful there), Slow Food, and Eater in the hopes of uncovering the perfect location to fulfill my inner hunger for a special experience. It's Pizza this Week on GREAT TASTE! Great pizza and Great Taste combined at Green Building Supply Tuesday night with pizzaiolo Aaron Hall featured as the maestro of dough. Aaron's passion for pies is evident as you watch his hands manipulate the once alive, dried, ground, and now alive again wheat infused with living microorganisms. The best part was the privilege of enjoying five different types of pizza including toppings like pistachio pesto with arugula, roasted potatoes, garlic cream, and sage, and hot calabrian chiles with fontina. Regenerative Agriculture and Fat Rice-A New Great Taste this Week! Dr. A. Thimmaiah, associate professor of Sustainable Living, joins me in the show's first segment to discuss the new 10-month certificate program at MUM to train future farmers. The program has three phases-classroom work, a practicum where each student will be given a quarter acre of land, and focus on an agricultural project, and concludes with a month long internship working with farmers in the USA, Bhutan, India, Italy, and other spots. The certificate will feature the very first university course in the United States offered on Biodynamic farming methodology. That part of the curriculumn will be taught by the co-exectutive director of Demeter Association Inc. (the organization established to represent Demeter International and entrusted with upholding the principles of Biodynamic practices and principles), Jim Fullmer. A groundbreaking ceremony will be held Friday, October 21 at 3:00 pm. for the new Ag Center. The location will serve as the classroom and laboratory for the new initiative, and is located just north of Reiff Grain and Feed on Highway 1. PLEASE CLICK ON "READ MORE" for information on the second half of the show!